My big game hunting career began with me hunting the African leopard; and by the time I joined the Rhodesian (now Zimbabwean) Department of National Parks and Wildlife Management, as a game ranger – aged 20 – I already had seven leopard scalps hanging from my belt. As a newly appointed game ranger in the Matopos National Park in 1959, one of my big-game control tasks was to kill stock-killing leopards on the farms and in the tribal communal lands that surrounded the park. And, throughout my first year of service, my purpose-in-life was to eliminate leopards from the park’s game-paddock-section, located deep inside the national park, because they were killing and eating the young game animals we were trying to re-introduce to the Matopos Hills. And, over the next 25 years, I was periodically required to hunt a stock-killing leopard – here, there, and everywhere – throughout the country. I understand leopards and I know why hunters want to pursue this beautiful and resilient big cat. I have learnt they can live off the smell of an oil rag; their prey base is very wide; and they occur – and succeed – right under our noses, everywhere. And I know that when they have acquired a respect for man-the-hunter they are one of the most difficult of quarries to bag. Unless you have been ‘out there’ hunting leopards – extensively – both succeeding and being repeatedly duped by their anti-hunting capabilities, you won’t understand any of these realities. This is why I understand, too, the nature-loving layman’s concerns for the leopard’s survival in this modern man-drenched environment; and why I understand society’s concerns when us hunters insist that we should be allowed to continue to hunt this elusive quarry. It is more difficult to explain why we believe that being able to legally hunt the leopard will improve its chances of survival. To get to the bottom of this complex and perplexing issue, we have to ask ourselves: What is it that people are concerned about when they observe that hunters keep pushing for the legal opportunity to hunt a leopard? 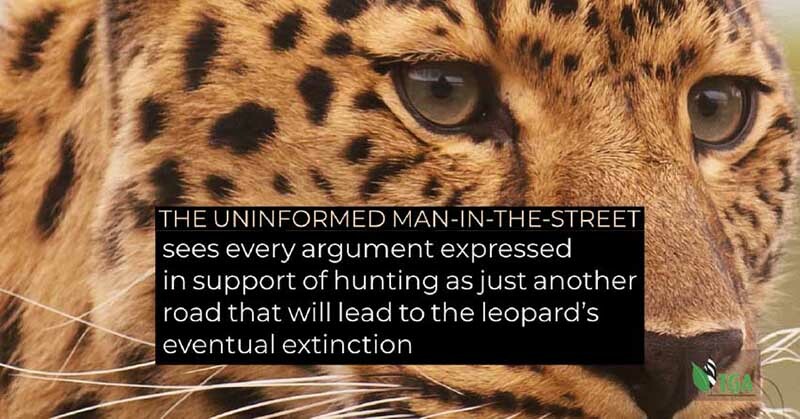 The answer is – I think – that the uninformed man-in-the-street sees every argument expressed in support of hunting as just another road that will lead to the leopard’s eventual extinction. So let’s use that perception as our point of departure. Of all the big cats, the leopard is the most successful. They are solitary animals and nocturnal. They catch and eat anything from mice to buffalo calves; and they eat the most putrid of flesh. On one occasion a leopard I had baited with a dead dog, visited the bait 10 days after I had laid it; and the leopard consumed the rotten skin after the flesh inside the carcass had been reduced to just a mass of wriggling fly larvae. In their stomachs, I have found the remains of snakes as big as small pythons; dassies (hyraxes); monkeys; domestic dogs; francolins (pheasants – and a clutch of their half-incubated eggs); monitor lizards; termites (flying ants); fish (catfish and tilapia); even grasshoppers. It seems they will catch and eat anything that moves. But I never once found the remains of a baboon. In our big game reserves leopards are immensely successful because, not only is there abundant prey, carrion left by other predators is readily available. In smaller dimensions, it would seem that leopards have many biological similarities to lions. In Kruger National Park (KNP), for example, they probably number more than 1000 (lions are said to number 2000 +/- 300); they have a gestation period of 100 days (lions 110 days); they have 2 – 3 cubs (lions have 3 to 4 cubs); and the cubs are independent at 2 years (as happens with lions). At three years of age leopards are fully adult and have started to breed (as is the case with lions). And like the lions in Kruger, mature leopard numbers in the game reserve represent a safe and stable population. When leopards become independent, they are evicted from their parental home ranges – by their own parents – after which they have to seek and secure a home-range of their own. What does a leopard get from its home range? Mainly – it has access to enough prey animals to live on. And they need to secure a breeding territory once they begin breeding, too. Occupying a home-range and defending a territory inside the game reserve where they were born, brings young adult leopards into direct conflict with larger and older leopards. Young leopards, therefore – as happens with young lions – are pushed from pillar-to-post inside the game reserve by the dominant adults, causing their perpetual dispersal. And, sooner or later, they move out of the game sanctuary in search of peace-and-quiet where there are no big, bullying, adults to harass them. Once they have been thus evicted, and find themselves on land outside the protected areas, the young nomads scatter quickly, far and wide. They disperse like a drop of oil spreads – in a flash – over the surface water of a pond. It is this important dispersal mechanism that creates stability within the game reserve’s resident leopard population. Within this milieu – in the absence of dominant adult leopards – the young nomads find it relatively easy to find both a home-range and a breeding-territory on man-occupied land. The only problems they will encounter will be associated with man. Nevertheless, if there are lots of dassies in the hills around, and lots of other small prey species, too, and the leopards leave the farmer’s livestock alone, they will survive. And, as long as they learn how to live with man – and they do learn how to live with man – they will thrive. Whether they ultimately survive or not, however, will depend very much on the human circumstances of the land on which they have made their new homes; and a lot will depend on the manner in which they adapt to those circumstances. It is from these ‘loose leopard aggregations’ – created by dispersing nomads – that the South African government is now trying to create circumstances that will allow the hunting of a small and sustainable number of leopards each year. And government has made it plain that the hunting of this quota will be strictly enforced. The government’s intentions in this regard, therefore, are good but their design is unenforceable. For the government’s plan to work, requires that private land owners maintain a reasonably large standing population of totally protected adult leopards on their properties, entirely at the land owner’s expense. And each leopard will likely kill and eat one domestic animal (a calf, sheep or goat), or one wild animal (a dassie; a hare; a springbuck; blesbuck; bontebok; mountain reedbuck; impala; klipspringer; lechwe; or baby gemsbuck) every week, just to stay alive. That amounts to some 50 prey animals a year per leopard – prey animals whose accumulated worth stretches into tens of thousands of U.S. dollars. And the leopards will have to breed – which means even more prey animals will have to be squandered. A trophy leopard is a male aged seven years or more. So, each trophy leopard produced will have to be fed one prey animal every week for seven years (350 prey animals), before it can be sold to a hunter – that is, before any financial return can be made on the farmer’s investment. So the cost of producing that one leopard trophy is compounded immensely. The bottom line is that it is not a feasible financial proposition to breed leopards on agricultural land, or on a game ranch, for the trophy hunting market. And government has decreed that a farmer may not shoot a leopard in defence of his domestic stock or wildlife. There is not a court in this land that will uphold a government department’s decree that a land-owner may not shoot a stock-killing leopard when it is caught in the act of killing his livelihood – his bread and butter. And there is not a government department that can afford to pay a farmer compensation for the large numbers of prey animals that leopards kill and consume every year. So, the government’s idea of forcibly maintaining significant numbers of leopards on private or communal land, for the purposes of producing trophies for the hunting market every year, is a dead duck in the water. No matter what the merits of this idea, it is simply not a feasible proposition. So the leopard is saved from extinction by default? Not exactly! The leopard has never been, and is not now, threatened with extinction! So how can it be ‘saved’ from something that does not exist? Extinction occurs when every population of a species – through bad management – declines until every last animal has disappeared into oblivion. And as I have explained: in our KNP model the leopard population is stable at 1000 animals; it is secure; it is not in any way threatened; and every year it keeps pumping out hundreds of surplus nomads onto the private land that surrounds the national park. So, no matter what we do with the nomadic leopards that have taken up residence on land outside the KNP, the leopard – as a “species” – will not be adversely affected in any way at all. But if man does not hunt these leopards, what is going to happen to them? I’ll tell you what is going to happen to them. As things stand at the moment, they are going to be shot by the farmer out of hand whenever they kill one of his cattle, sheep or goats (or, if they are living on a game ranch – when they kill one of his expensive (endangered?) Bontebok ewes). And their bodies will be buried deep by the farmers to make sure South African Nature Conservation officials never find them. This is called ‘The Three Ess’ management equation – Shoot, Shovel and Shut-up. And, in the face of uncompromising government constraints, this is what many down-to-earth farmers have been practising for years. And does that really matter? The parent population of leopards in KNP are, after all, still safe and intact? It does matter because making it illegal to hunt a leopard that really needs no special protection, and forcing the Triple-Ess solution as the only farming option, is the waste of a perfectly good leopard. There are lots of people who would give their eye-teeth to hunt a leopard – any leopard – and we could accommodate many such hunters. Furthermore, farmers would be handsomely compensated for the prey animals that the leopards destroy, every time they sell a hunt. All it would need is for government to see reason – to consider common sense as a sound human attribute – and to do away with leopard-hunting permits altogether. Leopards on private land should be considered ‘fair game’ – or ‘common game’ – because their elimination will not affect the survival of the species one little bit. As long as the KNP leopard population remains stable – no matter what we do with naturally occurring leopards on private land – the leopard, as a species, will remain safe from extinction forever. The time to apply protection is, or should be, when there is a need – and this will be broken down to be applied dependent upon the region, the species and the level of the ‘need’. No living creature which I can think of, has ever actually benefited from have a blanket-styled protection, thrown over it. why is it, I wonder that the measured and thought through response is always the hardest for those responsible, and to achieve. Dear Alec Swan: Everybody who comments on ‘species protection’ issues need to FIRST comprehend that “A SPECIES” cannot be managed at the “SPECIES LEVEL”. Species can only be ‘managed’ at their respective individual “POLULATION LEVELS” – population by population; and that this makes the “ENDANGERED SPECIES” concept invalid – which is why ‘blanket-style protection’ is never the answer to wildlife management problems. So, protection ‘devices’ for any species should be applied ONLY when particular populations of the species require such protection. 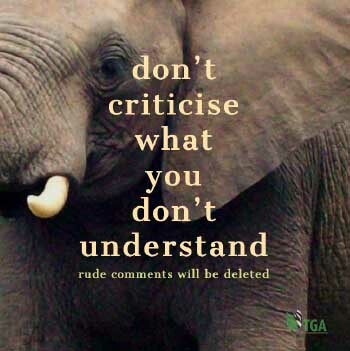 The so-called international ‘conservation community” – and governments – don’t understand this (and they don’t WANT to understand this) which makes all their efforts to ‘save a species’ by ‘blanket protection devices’ inappropriate and unworkable. Always remember: YOU CANNOT MANAGE “A SPECIES”! You can ONLY ‘manage populations’. And if you don’t understand this simple principles you should not enter ANY wildlife management debate. I’m only hoping that your last sentence wasn’t directed or aimed, at me. – – If it was, you misunderstood my intent. This sentence was a statement of fact. It wasn’t “directed or aimed” at anyone.